1) A quick update on Kingston 11 (2270 Telegraph Ave.), the long-awaited Jamaican restaurant coming soon to Uptown Oakland: It looks like chef Nigel Jones and his partners are in their final fine-tuning stages. The restaurant hosted one last fundraising event over the weekend (h/t @lettuceeatkale), and Jones told What the Fork that final inspections from the city have been scheduled for later this week. Look for a soft opening — with full dinner service — on or around November 15. Lunch and brunch service will launch in subsequent weeks. 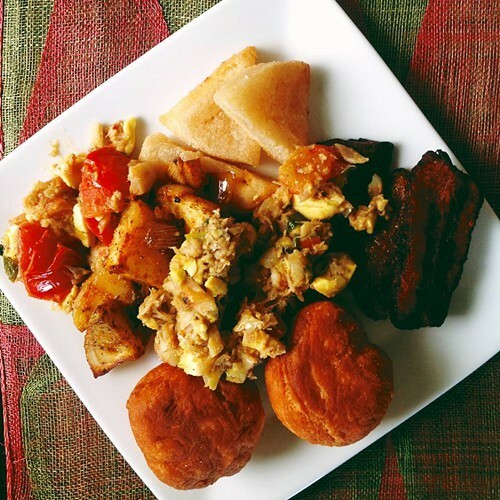 Coming soon to Uptown: ackee and saltfish at Kingston 11 (via Facebook). 2) The 2014 Michelin Guide list of starred restaurants was released yesterday, and of the thirty-eight Bay Area restaurants to receive at least one Michelin star, Commis (3859 Piedmont Ave.) remains the lone East Bay representative. James Syhabout’s Oakland flagship has maintained its one-star rating since that star was first awarded in the 2010 guide. 3) Daily Cal reports that a new burger restaurant called Eureka! (2068 Center St., Berkeley) will have its grand opening on Monday, October 28. The Berkeley location is the SoCal-based chain’s tenth restaurant. Owner Robert Suzuki told Daily Cal that the focus of the menu is affordably-priced handmade foods, including french fries that “take 24 hours to prepare.” Eureka! will also feature a rotating selection of thirty draft beers and a few off-menu high-end whiskeys like Pappy Van Winkle bourbon and Buffalo Trace’s Antique Collection. 4) Though it has temporarily discontinued its Friday night dinner program, Marrow, Uptown Oakland’s nose-to-tail sandwich shop, is celebrating its six-month anniversary by launching weekend brunch service, which will run on Saturdays and Sundays from 10:30 a.m. to 2:30 p.m. 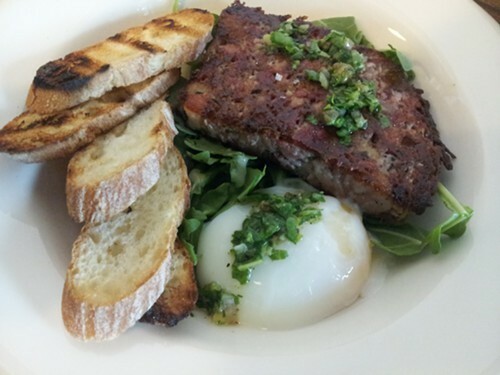 This past Sunday’s debut brunch menu featured stracciatella, French toast, and steak and eggs, among other dishes. Chef Jon Kosorek told What the Fork that he’s just testing the waters for now to see if there’s enough customer interest to make brunch a permanent fixture. For what it’s worth, Marrow’s weekday breakfasts are some of the tastiest (and most criminally underrated and under-publicized) in the entire East Bay, so I’d venture to guess that Kosorek’s brunches will be worth checking out as well. 5) One more tidbit of Uptown restaurant news: After closing its doors a couple of weeks ago — seemingly for good — the Loring Cafe (37 Grand Ave.) announced that it will reopen this week under a new chef, Ming Chen. 6) Berkeleyside notes the opening of Cup Story (2384 Telegraph Ave., Berkeley), a new Korean fast food restaurant where all of the food — mostly different variations on fried rice — is served in takeaway-friendly paper cups. 7) Tribune Tavern (401 13th St.) is hosting a Warriors Fan Fest block party in downtown Oakland this Sunday, October 27, from noon to 5 p.m., to celebrate the impending start of the NBA season. The street in front of the restaurant will be closed off, and the first 2,500 fans will receive free Oaklandish-designed t-shirts. A few Warriors players will even put in an appearance (at around 1 p.m.). Oh, and there will be food and drink: Tribune Tavern and its sister restaurant, Lungomare, will be selling “concession stand” style bites; Rock Wall Wine Company and Trumer Pils will supply the booze. 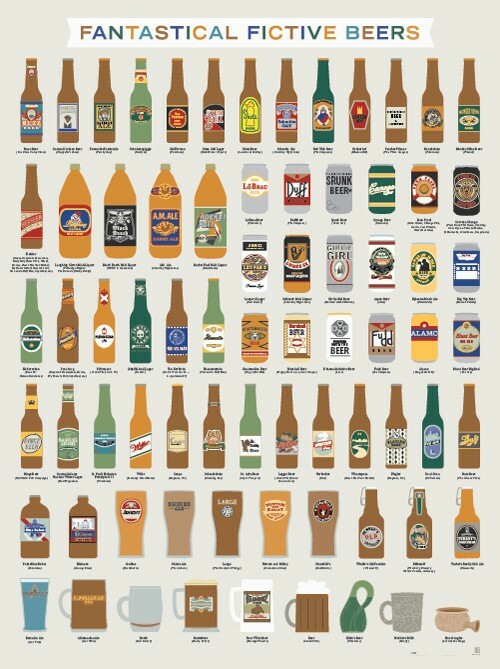 71 fictional beers (via Pop Chart Lab). 8) Apropos of nothing, here is a delightful piece of graphic art that you can purchase and hang on your wall: an artist’s rendering of seventy-one “Fantastical Fictive Beers” that run that gamut from Butterbeer to Duff Beer to (my personal favorite) Samuel Jackson Beer — cue the NSFW Dave Chappelle clip (h/t Deadspin/Foodspin). 9) Finally, ICYMI, the Bay Area might be getting its first soul-food food truck, and East Bay food movement folks are celebrating Food Day (October 24) throughout the week.